The handling of heavy air conditioners in particularly confined environments was now almost impossible for the customer. Competitor manipulators did not allow the operator sufficient vertical travel to operate safely and have the work table fully available during packaging operations. INDEVA® studied the customer’s difficulties and created an “ad hoc” solution to overcome all the customer’s difficulties. Combining its deep knowledge of ergonomics and design, it created a linear manipulator mounted on a bridge structure that allows to the operator an extreme and constant precision in the positioning of the load. 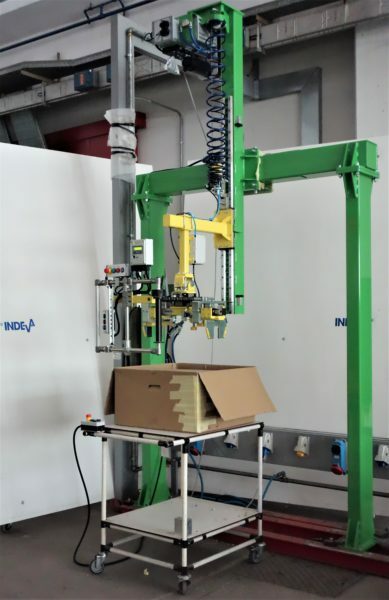 In addition, the bridge structure, combined with a button mounted on the customer’s line, allows to the operator, in case of need, to “disappear” the bulk of the manipulator, thus being able to proceed to packaging without danger or bulk. The speed of the operator has increased by 30% and the company has said it is very satisfied with the solution provided. INDEVA® is not only the partner that provides to the customer cutting-edge solutions, but also a supplier of certainties and advantages.